VOL. I NO. 47 REG NO. L5015 DELHI, THURSDAY AUGUST 5, 1943. DELECTABLE DOLORES War requires a lot of food; production of food calls for many men; the Army, Navy and war factories also need manpower, so women are being encouraged to do farm work. Sheila Ryan's Hollywood press agent used that as an excuse to send us this picture and he said that ahe knew all about farm work, including how to run a tractor. You may find your Christmas stocking disappointingly empty, chum, unless you pay strict attention to today's communique from Gen. Santa Claus. 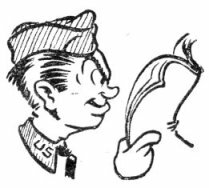 It may be 142 shopping days until Christmas on the home front, but to reach overseas soldiers, advises Gen. Claus, parcels and cards must be mailed during the period beginning September 15 and ending October 15, the earlier the better. "Special effort," announced Gen. Claus' communique from the North Pole Theater, "will be made to effect delivery of all parcels mailed during that period in time for Christmas." Existing weight and size regulations apply. Parcels shall not exceed five pounds in weight or 15 inches in girth nor exceed 36 inches in length and girth combined. During the Sept. 15 - Oct. 15 period only, the restriction will be lifted requiring addressees to state the srticles they desire from the United States. In other words, gift senders may purchase anything their hearts desire - and their ration cards permit. All G.I. 's in the Theater would do well to relay this information home immediately to avoid disappointment. Or cut this article out of the Roundup and mail it home. CHUNGKING - Japanese wit is puzzling. Often, Mr. Nip is most humorous when he strives to be most serious. "We express our regrets to you men who have taken great pains to come to the interior of China. We of the Fighter Command of the Imperial Japanese Forces take pride in the fact that we are the strongest and best in the world. We consequently express our desire as sportsmen to hold a decisive air battle with you in a fair and honorable manner. We can then prove to you the spirit and ability of our air force." The Japanese were afforded such an opportunity starting July 23 and continuing until July 29. It was starkly apparent from the proof - charred wrecks of 66 planes strewn upon China's soil - that the enemy was misguided in evaluating the ability of his air force against U.S. P-40's, B-24's and B-25's. 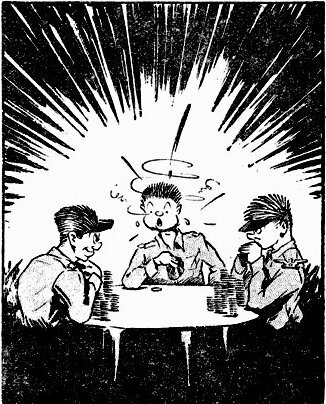 Members of the 14th Air Force succinctly summed it up this way after the fearful mauling the numerically-superior Japs invited by launching an air offensive to drive the Americans out of their forward bases in China: "The Japs are the best in the world until they look at a P-40, and then they are not generally even in the world." 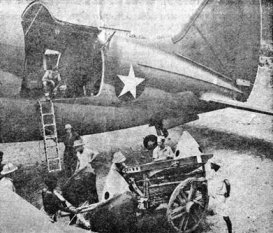 Last week, the Roundup pointed with pride to communiques issued from Lt. Gen. Joseph W. Stilwell's HQ in Chungking that 30 Jap planes had been downed, hinted there would be "more to follow." Maj. Gen. Claire L. Chennault, guiding genius of the 14th Air Force, recently announced over a radio hookup to the United States that the toll after eight bloody days was 66 Nips and 46 probables. "Our losses," he admitted, "were eight planes destroyed, but only three pilots - two Americans and one Chinese - were killed in action." The abortive effort to drive U.S. forces from the advance bases from which they are bombing Jap-held China backfired, for after the numerically-superior enemy was beaten off, our Liberators and Mitchells are now even better able to pound Hankow, Hong Kong, Hainan Island and other important Jap bases. During July, 34,000 tons of Jap shipping were sunk at the expenditure of only 74 tons of bombs and 25,000 more tons are probably on the bottom of the water. You can now OFFICIALLY drop your bombs in Burma and strafe the Hell out of Mr. Jap there, too. Burma has been at war against the United States and Great Britain since Sunday at 16:30. At any rate, that's the edict which was laid down by the Jap puppet government and aired over Radio Tokyo in every language, including the Scandanavian. In the earlier engagements, the Japs directed eight planes to a field defended as they commented via radio, by "museum pieces." Only one enemy plane was able to limp home on what proved a suicide mission. American strategy was razor sharp on more than one occasion. During one notable incident, Chennault sent B-25's to raid the main Jap base at hankow when it was reported that the planes had left the field. The runway was severly blasted. 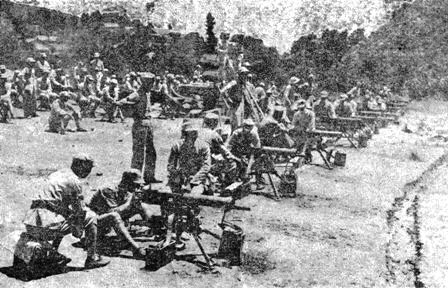 Next out, the Japs lay in wait at Hankow. But escorting P-40's caught four Zeros in a death waltz and bomber gunners opened up with everything but the antenna. Bomber gunners accounted for nine Zeros and the combined fighters and bombers for 13 probables. On July 28, B-25's and P-40's attacked the Taikoo Wharf area at Hong Kong and scored many direct hits. The following day, Liberators and P-40's attacked Hong Kong-Kowloon harbor shipping, scoring direct hits, and pounded wharves, shops and other targets on the Kowloon side of the harbor. One Zero was recorded as a probable. Meanwhile, a concomitant Jap attack in eastern China was costing the enemy one Zero destroyed, plus two Zeros and one bomber probable. Lt. Leon Zimmerman's sensitive soul writhed the other day as he read an account of his activities in the C.B.I. Theater as dreamed up in the Lancaster, Pa., New Era. Proudly, Zimmerman's hometown fishwrapper told the world that, as a bombardier, he had been awarded the "Junior Airman Medal." Not only that, but, continued the New Era, he received the award for completing 100 hours of combat duty in NEW DELHI. Wrecking crews of the 10th Air Force smacked Jap shipping of both the ocean and river variety last week. They scored a grand slam, doubled, on the Mu River bridge. None of our planes or pilots were lost, but interception by three Jap planes cost the Nip one fighter confirmed destroyed and a second probably destroyed. A combined B-25/P-40 operation on July 26 resulted in the destruction of three large buildings at Mogaung. Supply dumps at Pinma were set on fire. Tiangzup also was attacked, but clouds prevented observation of results. On the 27th and 28th, B-24's went ship-sniffing in the waters south of Burma. The first day a 175-foot vessel, discovered 30 miles north of Pagoda Point was bombed. Damage was reported. The following day a 250-foot steamer near Tavoy Island escorted by a Jap patrol boat was attacked. When it failed to go down it was bombed again from low level. Three minutes from the time it was hit it sank. Later in the day a 300-foot ship near Port Blair in the Andaman Islands was attacked. Near hits were reported. Best day of the week was the 29th. The bridge across the Mu River on the railroad running west from Mandalay to Monywa and north to Ye-U was properly knocked out. It had been hit many times before. This time, the east and west spans both were blasted to the river bottom, while a central span was blown out of place. The loss of this bridge will seriously slow military traffic on this line. B-24's again out over the Bay of Bengal attacked a 300-foot steamer docked at Chatham Island in the Andamans. Bombs were seen to burst on buildings near the ship in the dock area and a tremendous delayed explosion then covered the island with smoke so that observation of full results could not be made. At Ross Island, a 150-foot ship was bombed and strafed, causing damage. A naval vessel of the same length found 25 miles south of Port Blair was also damaged by strafing attacks. Mediums bombed the railroad installations and a factory at Tangon. The factory was hit and set on fire. Smoke billowed up 3,000 feet. Rolling stack was destroyed. Other B-25's damaged the cotton mills at Myingyan. P-40's bombed and strafed enemy troop and supply bases in north Burma. Buildings at Sumprabum were hit. Motor vehicles were strafed at Kamaing. Rolling staock at Namti was strafed and damaged. A repair car near Loilaw bridge was set on fire. At Manywet, eight fires were left burning. Military trails through the jungle were heavily strafed and damage was reported at Dawaw and at Ngawing. Mediums held the stage for the balance of the week. On July 30 they reported secondary explosions and fires at the oil center of Chauk and the destruction of storage sheds and rolling stock at Pintha. Warehouses at Myingyan and dispersed supply buildings at Meiktila were destroyed or damaged. Melaung also was bombed but clouds prevented observation. Only July 31 five hits were reported on a river boat of unusually large size in the Irrawaddy near Katha. Additional hits on a medium-sized boat and a big freight barge also were claimed. Other B-25's smashed barracks and warehouses at Bhamo. At Nyaingbinwun and at Legyi railroad yards and freight cars were damaged. On August 1 the B-25's were again at work on shipping near Katha. Direct hits were observed on three large steamers and other boats were claimed as damaged. Bombs were seen to burst among storage buildings on the docks and fires were left burning. Other B-25's bombed the suspension bridge over the Shwelhi River near the Yunnan border. Hits on the east approach and damage to the anchorage were reported. The airdrome at Monywa was bombed but results could not be seen because of clouds. The railroad yards at Hopin suffered damage to tracks and rolling stock. The machine gun will be a basic weapon in the ejection of the Jap from the territory he wrested from China. 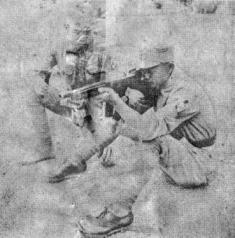 Lt. Garrell Prim, an American instructor, conducts a class in the nomenclature of the tommygun as Chinese soldiers listen. Ready - aim - fire. Not exactly the procedure, but one Chinese officer prepares to fire the tommy gun, while another looks on critically. 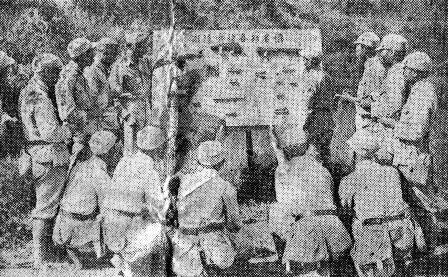 "Somewhere in China" officers and enlisted men of the United States Army are teaching Chinese fighting men the military niceties of modern equipment and tactics. 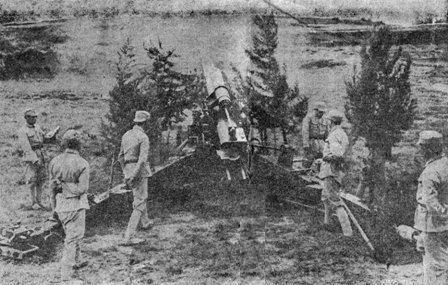 When the day of reckoning in China comes, the Jap will feel the impact of such training given our Chinese allies, who were not prepared or equipped when the enemy first struck. 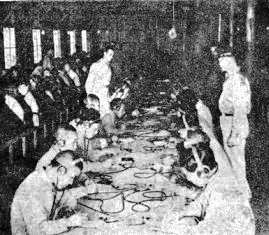 The Chinese-American training camp pictured on this page and another in India will provide Generalissimo Chiang Kai-shek's forces with a nucleus of military talent that the Gissimo will exploit to Mr. Nip's discomfiture. Guiding geniuses behind the camp in China are Brig. Gen. Thomas S. Arms, Infantry Commander, and Brig. Gen. Jerome J. Waters, Jr., Artillery Commander. Communications is a vital necessity, a fact which Maj. Albert Riley, head of the Signal School, is impressing upon students. Nothing is forgotten. Capt. 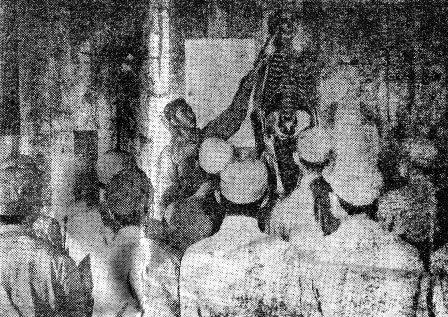 Albert Young teaches a class the elementary functions of the body with the use of a skeleton. With a picturesque scene in the background, S/Sgt. 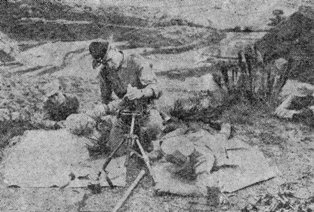 George A. Booth demonstrates how to load the 60-mm mortar, a basic weapon. Finally, a weapon with heavyweight punch - the 155-mm field gun. However, no single one of these waepons nor any single one of these techniques is enough to master. ALL must be learned. For risking their own lives to save those of comrades, the Soldier's Medal has been awarded to Lts. Henry L. Groninger and Thomas L. Murphy. In addition, 52 other awards have been announced by the 10th Air Force Headquarters. Groninger was decorated for his gallant conduct when the plane in which he was flying as bombardier crashed shortly after taking off on a combat mission. Almost immediately, there was a series of explosions from the bombs and gas tanks. Though thrown clear of the burning plane himself, Groninger returned to it and assisted the severely injured radio operator in getting clear, and then returned again to attempt to extricate the navigator, who was pinioned under the wreckage. Murphy probably saved the life of the bombardier of his plane after it had been shot down into the sea by enemy anti-aircraft fire. As the plane crashed, the bombardier was thrown through the nose of the plane and rendered partially unconscious and helpless. Murphy, though suffering from shock himself, swam through the rough water to the rescue of the bombardier, gave him his own life belt because the bombardier's had been blown off, and helped him gain the shore. Lts. Henry L. Groninger, Thomas L. Murphy. Maj. Wesley Werner, Lt. George W. Cook, T/Sgts. Adolph Scolavino, Aden E. Jones; S/Sgts. Bernard L. Bennett, Edward Sulley, Charles E. Vickers. Maj. Francis E. Brenner, Capts. Wilbur H. Wittliff, Charles P. Simpson; Lts. Robert A. Corrigan, Emil S. Gavlak, Thomas L. Mackward, John C. Kelley, Joseph E. McCord, Cecil W. Painter, Phillip K. Stephens, Edward L. Rathbun; S/Sgts. Edward M. Blaszczyk, William Carver, Frank J. Chiarello, James W. Rissell, Eddie C. Rouse, Francis E. Sawyer. Lts. Otis J. Burris, Merill R. Parker, Martin W. Young, Edward M. Capucci, Dan L. Flowers, Claudius B. Ward, Joseph A. Baldanza, Marion T. Brown, Remson D. Donald, Neal J. Edwards, Melvin P. Fox, Laverne F. Grundman, James L. Hannigan, Hilliard O. Peavy, Carl F. Samuelson, Ronald D. Shirlaw, Phillip J. Simonetti, Robert K. Yeck; F/Os Owen K. Buller, Richard D. Moore; T/Sgts. Harvey L. Cook, Michael J. Gameos, Dimitrie Slobodniuk; S/Sgts. Arthur G. Clark, Robert C. Connolly, James H. Kearns, David W. Roberts. From an air service center in India come these two unique photographs. Left, S/Sgt. Jack Alford amazes an Indian snake-walla (as well as himself) by wearing one of the owner's reptiles as a necktie. In the other half of the panel, the center provides a scene of contrast in transportation. The powerful 20th century airplane over-shadows the rickety, centuries-old bullock cart, which G.I. 's have pressed into use to convey parts for repair. And cool, sparkling fountain running down the glade. A swimming pool as deep and wide as the ol' Pacific Coast! I'll have a giant case of beer - a bottomless supply! But me - I want a swimming pool, to cool my swelt'ring hide. They even think it would be nice in wntry Illinois! A swimming pool and all the beer . . . my wife and I can drink! That's bogged with sudden rain! Ah! - Give me trees to hack! I write you every day. That is worthwhile to say. Or else it's all been told. And i miss you very much. Lt. Col. John M. Williams, 35, former enlisted man, ship's radio operator, soldier of fortune and signal officer with the 14th Air Force, has left for the United States - his first trip home from China since 1939. Williams came to China in 1939 to be a radio instructor for the Chinese Air Force Cadet School and joined the AVG at its inception in 1941. It was Williams who was primarily responsible in building up the AVG air warning net, which was considered to be one of the finest in the world and materially aided a tiny air force in wreaking havoc upon an enemy vastly superior in numbers. The officer is retruning to Wahington for two months' study to familiarize himself with the latest wrinkles in radio. He praised Chinese-American cooperation in remote stations throughout China. Officers and men of the Chinese Training and Combat Command stood at attention the other day as Brig. 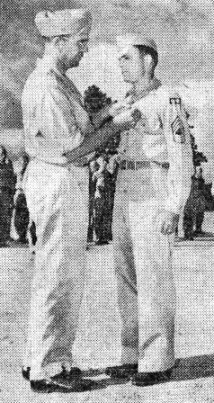 Gen. Frederick McCabe pinned the Legion of Merit upon the breast of M/Sgt. Wilber D. Chambers, instructor at the Artillery School. The high honor went to Chambers for outstanding services rendered in Burma during the tumultuous period between March 25 and May 22. In addition to duties regularly assigned him, Chambers successfully completed radio repair, maintenance and operation under the most difficult conditions in the face of continued Jap attack while Allied headquarters was being moved rapidly from place to place. By his enthusiasm, ability and devotion to duty, he provided uninterrupted radio service when continuance of operation was vitally essential. EAST INDIA AIR SERVICE BASE - Ingenious G.I. 's located here deep in the heart of Assam and in the Bengal country where supplies are long reaching them have improvised many gastronomic delights and have picked up many ideas for culinary living from Indians who inhabit this part of the country. They have gone into the jungle and emerged with many pounds of wild game that they have killed and had carried out for them by dozens of coolies. It has given them variety in their meals and most of them, for the first time, have tasted country life "in the raw." 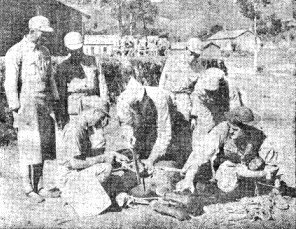 Included in the many kinds of game that they have brought into camp for the mess sergeant, who doesn't know exactly what to expect next to carve and cook, the men have found frogs legs a delicacy for which they paid $1.25 to $1.75 per plate back home. These expeditions for frog legs were instigated by M/Sgt. Endsley, of Bloomberg, Tex., and T/Sgt. John T. Duke, of Marion, La. They grew a bit tired of "C" rations which they claimed they were getting three times a day because of the length of time it took to get supplies to them. 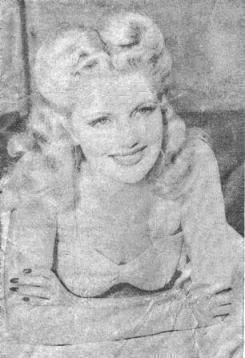 Their attention was called to the fact that frogs were in abundance when G.I. 's of the base complained that the lowly creatures were keeping them awake at nights. Some 50 yards from camp lay a pond where there "were enough frogs to feed the whole of the U.S. Army," so the boys said. 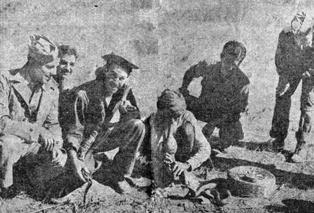 Two Roundup correspondents visiting the camp were included in a party headed by S/Sgt. Owen R. Miller, who hails from Wilkes Barre, Pa. Miller said that when the hunts first started spears weren't necessary, because the frogs could easily be caught by simply bending down and picking them up. A flashlight was used to blind them. But the spears are needed now. The frogs are wilier. The boys say that one good thing about it all id that Sgt. Schneider, Of kaplan, La., unlike the average G.I. mess sergeant who practically pulls his hair out at the sight of more food to prepare, never complains to anything the boys bring in for him to cook, but looks on new food as a welcome change on the menu. Just wanted to drop you a line to let you know how wonderful it is up here in China and how much fun we all are having. I'm very glad you persuaded me to volunteer. Of course, we don't have any days off in my office, but that doesn't make any difference to us. Because we all want the war to be over as quickly as possible and so we don't mind working all hours of the day or night. The ratings in our outfit have been frozen, so no one can get promoted for a while. We should worry. That's more money the government can save. Anyway, we can't all be promoted all the time, can we? Can we? We've got lots of games and all sorts of amusements when we're off duty. We have a deck of cards and we play all kinds of games with them . . . seven-card stud, five-card stud, draw and so on. And there's another game we play with two dice. We invented it up here and thought up a name for it, too. Craps, we call it. Of course, money is involved in these games. But no one cares about winning. That's just to make it interesting. Oddly enough, it gets quite interesting when you bet money. Some of the men got very interested last month. They're wearing barracks bags with armholes. Some of the boys up here drink. But only vodka, and that's very mild. You can drink a bottle without going blind . . . I've heard. But there are so many other things we can do to pass the time that I don't bother about drinking. We can play horseshoes any time we want or go for a walk. This is very refreshing if you don't mind steps. You have to go down two flights of steps and up four to travel 100 yards. I've climbed so many steps in the last couple of months I figure my mother was frightened by an escalator. So you see, we're so busy and happy up here we don't even think about women hardly at all . . . hardly. And thanks, pal, for getting me to volunteer for this post. Thanks a lot. P.S. If you believe any of this, you are even a bigger jerk than I thought possible . . . if it's possible. This is a little dissertation on "recreational poker," or how the Delhi boy got clipped in Assam. Up in that area are two characters known as Col. Robert M. (Holy Joe) Cannon and Maj. Vernon (Outcast of Poker Flat) Slater. If you have any ideas about a little friendly game of chance, stay away from these two individuals. You have been warned. It is said that their two bashas overlook the finest "Victory Gardens" in India. We saw no chard or Brussell's sprouts shooting eager green tendrils toward the occasional sun. But we did see each invading the other's garden during the dark of the moon, shovel in hand and with a look of sheer guile, searching for the buried treasure that has become theirs in repeated poker games. The fact that neither has dug up anything but PX supplies in the other's garden is a tribute to an ability to conceal that has seldom, if ever, been seen. Additionally, the two gentlemen have constructed one of the finest nets of land mines and booby-traps men in this or any other war. To get back to our story. We arrived in Assam, not as the enemy from Delhi, but as a messenger of good cheer. Like the Greeks, we came bearing gifts. We brought our rye ration and a bottle of gin from another kind soul. We brought a carton of Camels that was donated to the cause and therby caused us, oh agony, to run out on the way home. We offered a helping hand to those in travail; joy was unconfined. Suddenly one night at dinner Slater said, "How about a very friendly game of recreational poker?" We did not associate this with our announcement that we were leaving the following day. Recreational poker was explained this way: Seems three of the hot shots had been winning too much money from the country boys. The winners themselves asked the general for a directive on poker which brought the "recreational" aspect which, in effect, meant that you could play poker as long as you didn't lose more than you would normally spend for an evening's recreation. We were touched. We innocently responded when asked to name the stakes. We named the ones we use in a friendly little Delhi game, but neglected to specify that games would be constrained to five-card stud and draw, with no card wild. We did not gamble on "baseball," "spit in the ocean," and "seven-toed Pete." We believed in the essential philanthropy of our hosts. We were "touched" again. It all started off according to Hoyle with a five-card stud game in which we had jacks wired. We bet the Hell out of them and got beat on the fifth card by a guy who had no business sticking around. This went on and on. Slater and Cannon every so often would announce a "memorial pot" for the guest. All players were instructed to fatten it. We always did, but we never won one. Thus, then, ended a beautiful friendship!